"PBS and our nearly 350 member stations, along with our viewers, continue to remind Congress of our strong support among Republican and Democratic voters, in rural and urban areas across every region of the country. We have always had support from both parties in Congress, and will again make clear what the public receives in return for federal funding for public broadcasting. 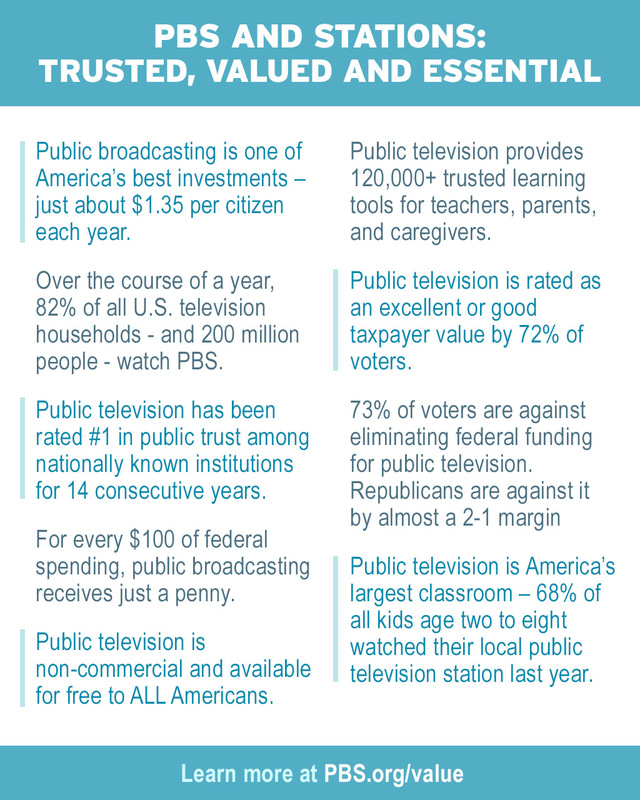 The cost of public broadcasting is small, only $1.35 per citizen per year, and the benefits are tangible: increasing school readiness for kids 2-8, support for teachers and homeschoolers, lifelong learning, public safety communications and civil discourse." Two new national surveys — one by Rasmussen Reports (subscribers) and another conducted jointly by leading Republican and Democratic researchers for PBS — reveal that voters across the political spectrum overwhelmingly oppose eliminating federal funding for public television. Rasmussen shows that just 21% of Americans – and only 32% of Republicans –favor ending public broadcasting support. In the PBS Hart Research-American Viewpoint poll, 83% of voters – including 70% of those who voted for President Trump – say they want Congress to find savings elsewhere.